The U.S. and Russia are working jointly to create and implement a 21st century version of Sykes-Picot. They have decided that Syria must be divided and they have determined how it is to be divided. However, it is important to grasp that neither the U.S. nor Russia are seeking an end to the conflict in Syria. 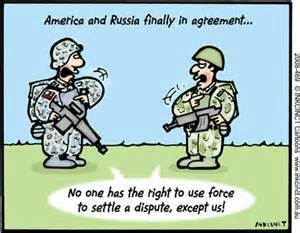 As things now stand it is in the interests of both the U.S. and Russia that the conflict should continue until the final agreement is agreed upon. Peace is not the objective; rather, the objective is a “functioning” Middle East influenced by major powers under their agreed-upon and mutually supporting objective. Nor is regional peace an objective. The U.S. and Russia have reached a behind-the-scenes agreement that the Middle East must be kept in a perpetual state of low-grade conflict. The reason? Because peace means that one of the Middle Eastern nations has grown powerful enough to establish and enforce peace on the region. Steven Weingartner and LTC Sangari co-authored this article. Steven Weingartner is the NEC-SE chief editor and is an award-winning military affairs writer and editor specializing in military history, national security strategy, defense policy, and national military strategy and operations.